I've just returned from my trip to South America and I'm feeling totally and utterly refreshed!! Unfortunately, NYC is not matching my enthusiasm with its absolutely frigid weather. In any case, I'm pleased to share this painting I did for my very dear, sweet, beautiful friend Jill who got married this past September. We've known each other for 10 years now, and I can't believe that we once lived on the same residence floor in college, and that I got to watch her walk down the aisle with her true love this past Fall. It took me a little while to get my gift together for them but I finally did. As the saying goes, better late than never. Jill's absolute favorite color is turquoise. 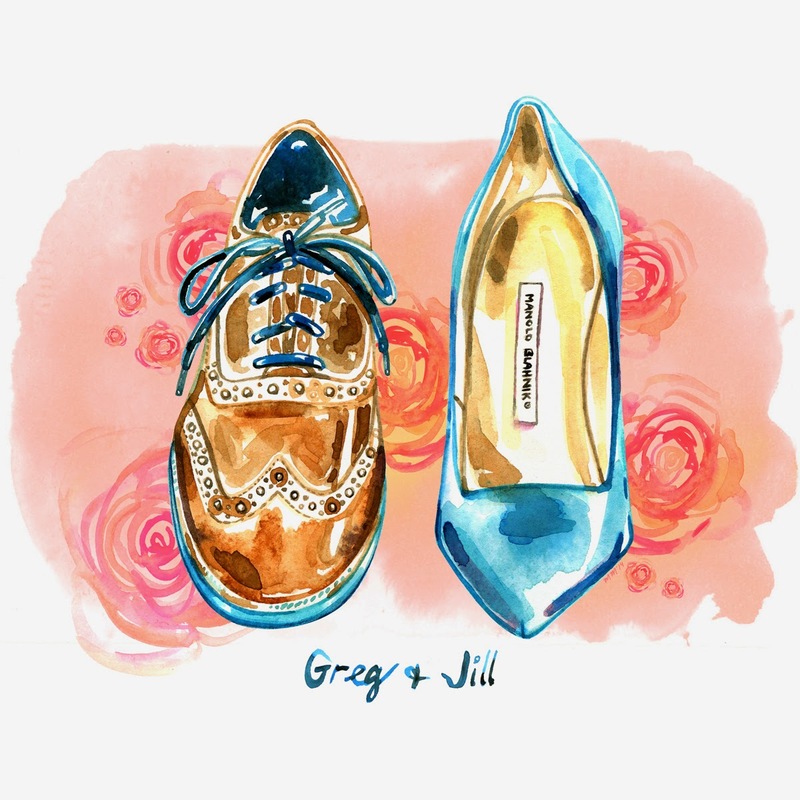 When I saw both her and her hubby wearing shoes in said hue, I knew what I had to paint for their gift, et voila. I'm thrilled that they love it so much. Anyway my loves, I'm SO excited to share with you illustrations inspired by my incredible trip abroad and promise to be back on the blog very soon. I love your background for the shoes! So neat! I love how there is turquoise on both shoes! Gorgeous illustration! I bet the trip was a blast! Colourful and inspiration pure!